I am not a Sherlock watcher, but from what I can guess, the title of this episode echoes an iconic episode of that BBC series. I did a little research and from what I gather, Sherlock’s Reichenbach involved (among other things) long-building confrontations between opposing characters, a no-win endgame, a lost fail-safe and an ultimate sacrifice by the flawed and disgraced hero. There were many such important confrontations in the second episode of Supernatural’s season 10. First, Cole finally gets the moment he has been waiting and training for, for 11 years; a chance to avenge his father’s death and kill Dean Winchester, the man he holds responsible. In a flashback we see young Cole, slipping in his father’s blood, with 2003 Dean looming large over him (thank you VFX and wardrobe for that throwback, complete with John’s leather jacket and the Samulet). Cole is resorting to torture to extract Dean’s whereabouts from Sam, beating him and screaming in his face; “Where is he? !” in a scene eerily reminiscent of Sam’s own quest to find his brother. Cole finally catches up with Dean, after he lets Sam escape so he can follow, but the confrontation isn’t quite what he has geared up for all these years. I personally think Dean Winchester would have bested him under the best of circumstances, but Cole certainly does not stand a chance against Demon Dean. In a spectacular fight scene (many kudos to the Supernatural stunt and fight team), Dean smiles his way through a punishing beat down. Jensen Ackles is simply masterful as he taunts and plays with the wounded vengeful soldier, like a cat would with his prey. The reference to the Princess Bride is certainly apt, but this Inigo Montoya wannabe does not get his payoff, not even the satisfaction of a dignified death. Crowley is having his own run in with Demon Dean. He keeps insisting that the only way to keep control over the Mark of Cain is to keep it sated with violence and death. But when he sends Dean on a kill-for-hire where he kills the client instead of the intended target, Crowley realizes he is really not in control of Demon Dean Winchester. How much humanity is left in this new Cain? He is full of menace and violence. He shoves Crowley to the ground without fear or hesitation and he kills with a bone-chilling smile. Yet he makes choices that seem to indicate more than just a cold willingness to kill. “Tell me Dean, what are you, a demon? Maybe you are human? Do us all a favor and pick a bloody side!” Crowley has had enough and decides to hand Dean back to Sam, for a price of course. Cas is still traveling with Hannah, who has decided that it is ok to stay on earth after all and help her ailing friend. She is none too pleased that Cas wants to go help Sam and expresses her distaste for the bad influence of the Winchesters. Cas has been teaching Hannah a thing or two about humanity and he firmly declares Sam and Dean Winchester the best men he has ever known and his friends. Cas still has to drive everywhere apparently, which must mean that heaven only has that one backdoor open and that all those poor souls, including Kevin Tran, are still stuck in the veil. If I was an angel, I would get right on that. Poor ailing Cas crashes the car and never quite makes it to Sam’s side. As Hannah’s bond with Castiel deepens she decides to take matters into her own hands and confront Metatron in his prison cell in heaven to plead with him to return Cas’ grace. Curtis Armstrong brings his A-game here as he, perhaps for the first time, comes across as an actual menace, promising revenge. Cas knows all too well how deals end up bloody and in tears and he rebukes Metatron firmly. But Cas is indeed a dead man walking, as Metatron taunts, and who will protect heaven, if not the dying Castiel? This is a Cas who shows he has learned valuable lessons and who is truly exercising his free will. But he also is confronted by the fact that even the right choice has consequences. In a scene right out of Casablanca, we see Dean pensively playing a piano, as Sam walks in (of all the gin joints…). The look on the younger Winchester’s face is one of devastation and determination. He is going to save the brother he thought lost forever, whether he wants to or not. And Dean does not want to be saved. He mocks Sammy’s tear filled puppy dog eyes but Sam will not be deterred from bringing his brother home. As many tweeting while the episode aired noted, this choice of words by Sam Winchester is very important. Not only does Sam declare that he is there because Dean is his brother, which considering last season is already significant, but he says he wants to take him home. Sam has never really known a home. He has never trusted the concept, because it would always be taken away from him. He didn’t even think the Man of Letters bunker was one. Yet that is the word he chooses. I have to admit that my eyes were as teary as Sam’s during that scene. 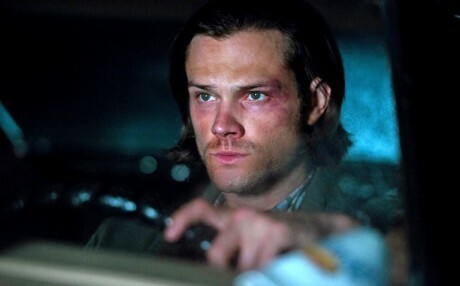 Sam manages to capture and handcuff Dean, while his fight with Cole distracts him, and as they take off in a neglected and filthy Baby, it starts to become clear to Sam just how dark his brother has become. This Dean, still sporting a smile, has no mercy. Not for some guy out to avenge his father, not for his once beloved car and not for his brother. What a stellar episode written by Andrew Dabb and masterfully directed by Thomas J. Wright. The editing was sharp and the performances outstanding. Down to the music choices and the careful pacing, it worked for me on every level. I love when we get another perspective on the Supernatural universe. We get to see how a Winchester hunt can be as devastating and life altering to a young boy like Cole, as the loss of their mother was to them. To Cole, Dean Winchester is the monster who turned him into a hunter; at the end, even a Supernatural one. Travis Aaron Wade as Cole really held his own and considering the tremendous performances by Jensen Ackles and Jared Padalecki, that was quite a feat. Castiel’s story truly has become a personal one. Misha Collins’ performance as Cas is appropriately introspective and I particularly loved a very sweet moment he has with a little girl as they share a dream, a smile and some questionable cereal. 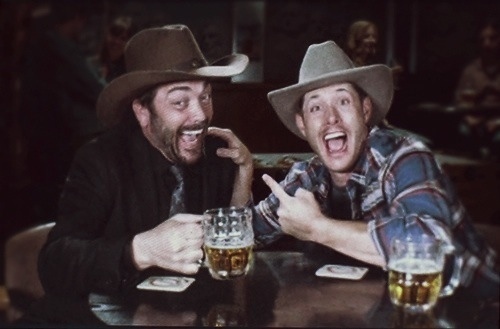 And who can forget a lovelorn Crowley (Mark Sheppard), newly broken up with Dean, listening to Lonely Girl and wistfully looking at photos of good times with his former bestie. There are some questions: Cole’s age as given doesn’t really work considering the actor cast, the character’s military career and the age of what I assume is his kid. I know that he had to be made 24 to fit him into the Supernatural timeline, but it doesnt quite add up. I’m wondering where Cole picked up his southern accent; basic training maybe? It sure wasn’t Nyack, NY. Also, this may be on purpose and be explained later, but where was the older brother that Cole talks about when he first captures Sam? The camera lingered on the Trenton family photos quite deliberately and all I saw was a mom, a dad and one boy. Another thing I would like to see is the current state and rules of heaven made a little clearer. Is heaven open or not? If so, why are Hannah and Cas driving around in a car, and if not; freeing all those screaming souls from the veil should really be part of the story. Tessa wanted to die because she could not take the suffering; that seems to me to be a matter of some urgency. I really can’t wait to see how things play out. What is Crowley’s end-game? He now has Cain’s blade and what does that mean for Dean? How is Sam going to save his brother? And what will the lasting effects of the Mark of Cain be? Will Dean need to keep killing in order to his demon at bay? I guess it is good that the Winchester family business involves the spilling of a lot of blood.